July’ke these photos, me promise! Had a project which ate up most of the last half of July; thus, another delayed update. So, again I shall forgo the wacky intro, and let you get right to the photos. July means Independence Day, and that means freedom! Now, for some folks, freedom means free stuff, and that’s not good for our nation. But, it is good when the free stuff trades hands at a Suncoast Diecasters meeting! We freely start off with these things I freely gave to Ken. 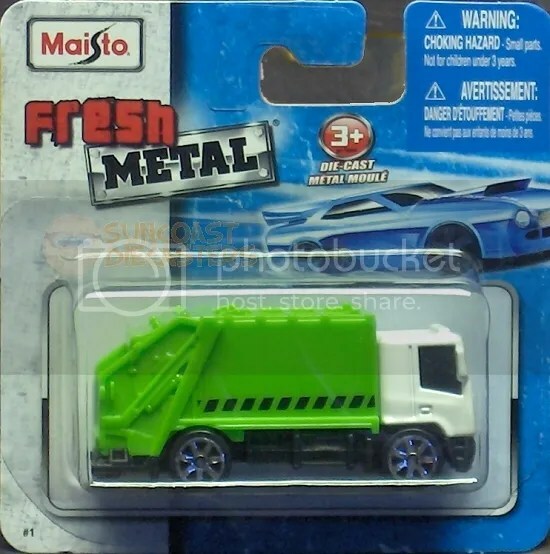 First is this very nice casting of a garbage truck from Maisto’s Fresh Metal line. I don’t know if this is based on a production vehicle or is simply a “generic” garbager; I’ll have to find from Ken later. 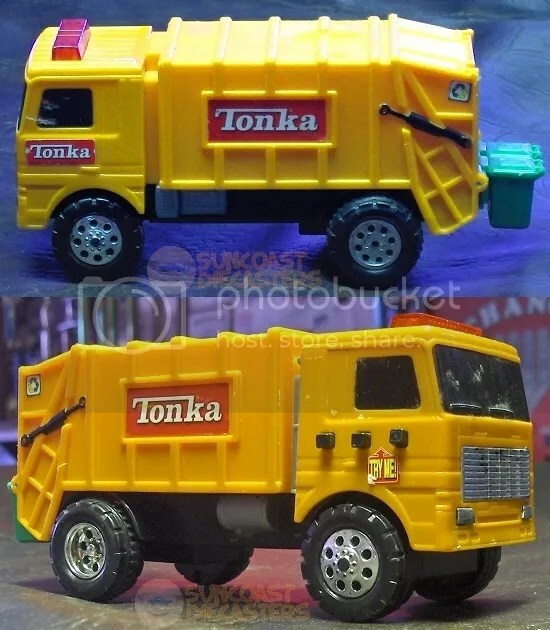 But it looks good, and of course it’s in authentical garbage truck colors. As I’ve pointed out before, there is actually very little metal on a Fresh Metal model, but some of the castings are quite well-sculpted. This one’s a thrift store find. I’m often surprised at some of the high-quality toys I find amongst the genuine junk at a thrift store. The cans on the back flip up on a little rod, although I’m really not sure why. It also has a pull-back motor which still works. What doesn’t work are the batteries that power the lights and sound effects. But, I left two of the three batteries in the truck so’s Ken would have a reference for replacing them. This is the severalth time I’ve donated a truck to Ken’s scheme to Dominate the World via Toy Garbage Truck Army, because that’s just the kind of friend I am. The Tonka reminds me of the short-lived Tiny Mighty Mo line. 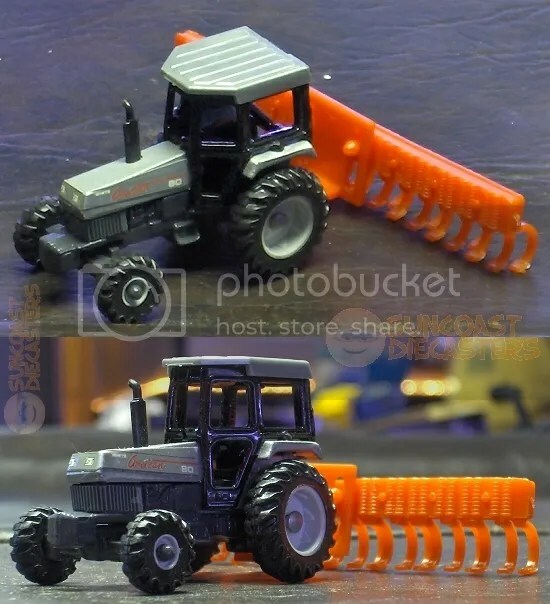 Next up on our double twin-spin of free goodies is this Matchbox Ground Grinder, which I beRAOK’d to Big Tractor Mike. Found it during the same thrift store hunt as the Tonka above. While a very realistic sculpt, I can’t prove whether it’s based on a production vehicle. It seems to be the 2013 first-edition model. And finally, these weapons which go to Kenner Aliens action figures. I gave them to BTM for free … but I also kind of owed them to him. If you’ll recall from our March meeting, Mike bought a bunch of Aliens toys from me. Well, it turned out that these weapons should have been included. 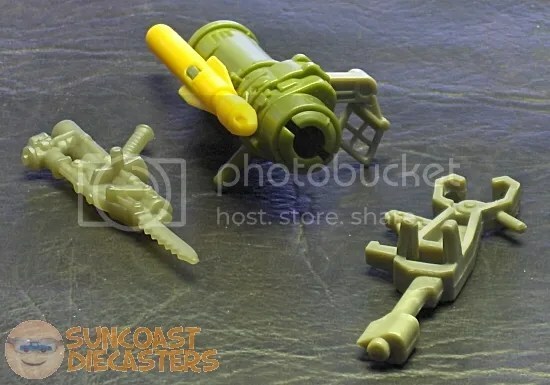 The missile launcher and … grabber-thing … go to Hicks, while the … I dunno, atomic Sawzall? … belongs to Ripley. Yep, nothing enhances the authenticity of movie toys like completely inauthentic accessories! 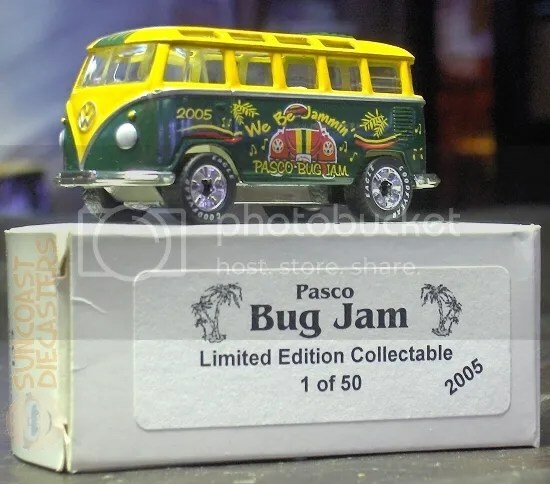 Tom happily acquired this Pasco Bug Jam custom collectible from BTM. Don’t know if this was a custom deco by a PBJ member, or ordered through Matchbox; regardless, it be mighty sweet-lookin’! Will Tom go to the 2015 Jam? Only his nail technician knows for sure! Ain’t sayin’ much about this. Just that Big Tractor Mike has one available. For now. Some folks go crazy chasin’ this sort of thing, is all I’m sayin’. You wants a bigger picture? Go grabs you one here. 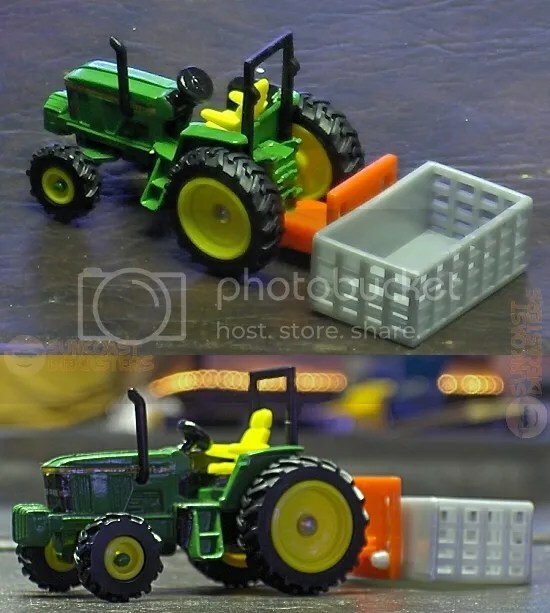 John Deere 6400 with pig carrier. White American 80 with mounted excavator. White American 80 with square baler. White American 80 with posthole digger. White American 80 with bale fork. 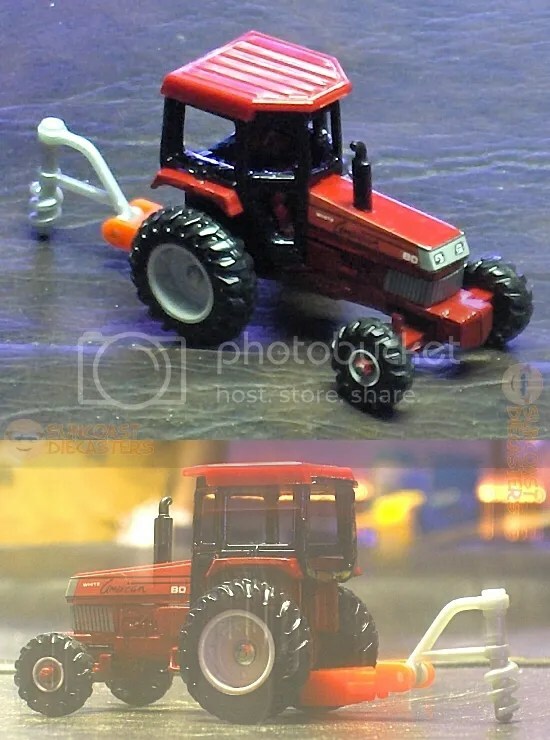 All the above tractors are very cool (and Doug was smart to hook up the accessories), but my favorite is this little guy here. No, there’s no accessory, but it doesn’t need one. 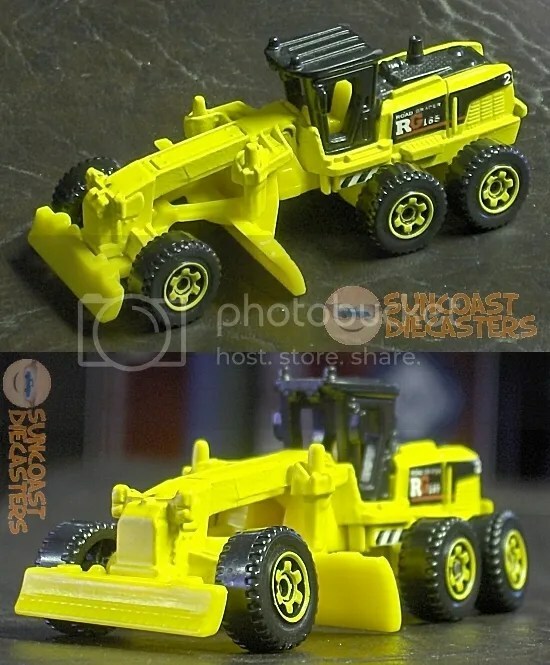 This is a John Deere Skidsteer (yes, also by Ertl), and I think it looks great with so much detail packed into such a small space. Look at all that articulation! 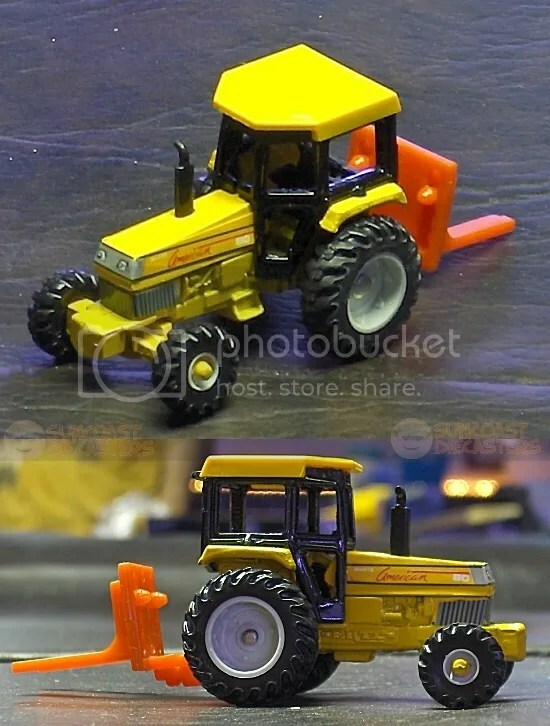 I can only go by these photos, but I think there are about 143 points of articulation on the model. The lower stance reminds me of Yellowjacket from ”Ant Man”. You may notice that this next set of photos seems to be not from the meeting. And you would be right! As I was packing up to leave, Big Tractor Mike came over and RAOK’d me with this European beauty. I joked with him about having to set up the camera again. These photos I of course took at home. This is the DeTomaso Mangusta, by Corgi. It’s a larger-scale model, somewhere in the 1/40s or 1/50s. 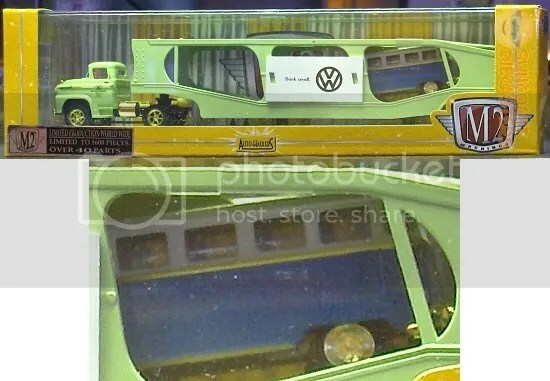 You can see the mid-line engine and spare tire in the inset below. 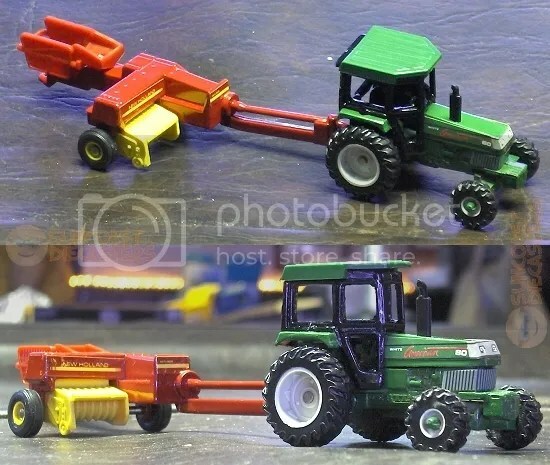 I found exactly one page online that specified the scale as 1/43, which makes sense, but I can’t prove it on the toy. The make and model are shown on the base, but no scale is stated. In fact, in this full shot of the base, you can see that there’s very little info. There’s no scale, no copyright, no patent number, no chassis, no nothi– … Wait … What … Where’s th– … What happened to the chassis?!!? Hi there. You had to scroll quite a bit to get down here, didn’t you? 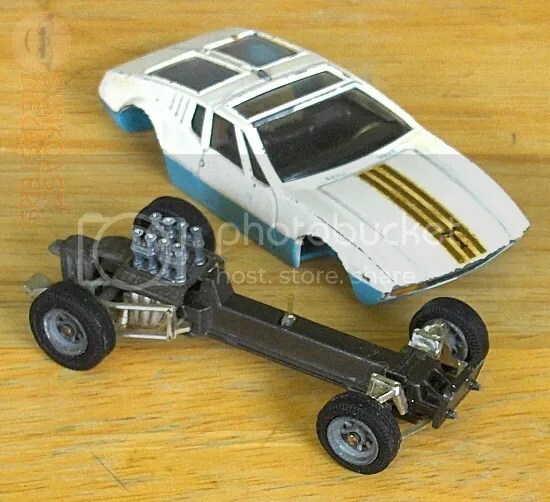 Anyway, as I was saying, Corgi’s designers decided to make the chassis removable. 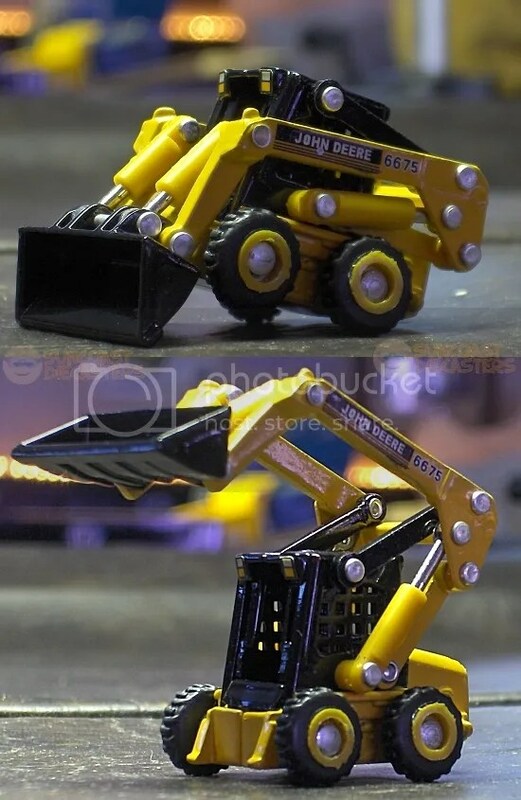 It’s an interesting gimmick, and certainly adds a quirky extra value to the model. 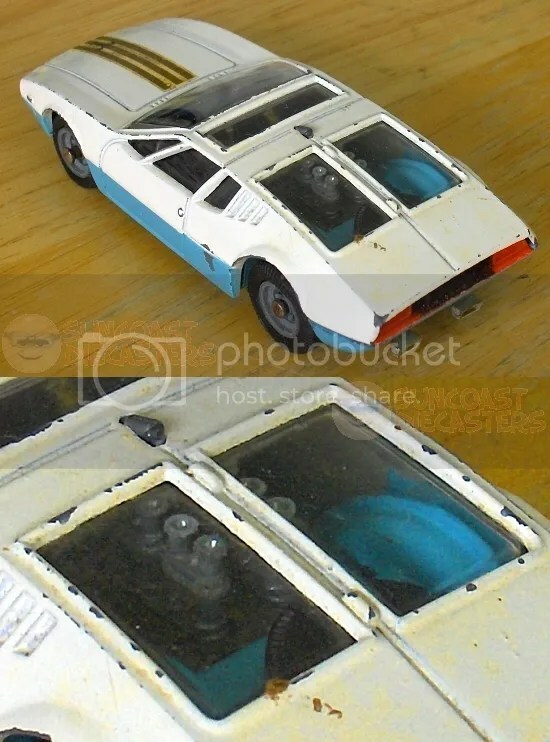 For its large scale, its great detail and its neat gimmick, I hereby declare the Corgi DeTomaso Mangusta to be Suncoast Diecasters‘ Find of the Month (*)for July 2015. Michael, thank you, brother; this is a seriously awesome gift. I’ll let you know if I ever figure out how to put it back together.